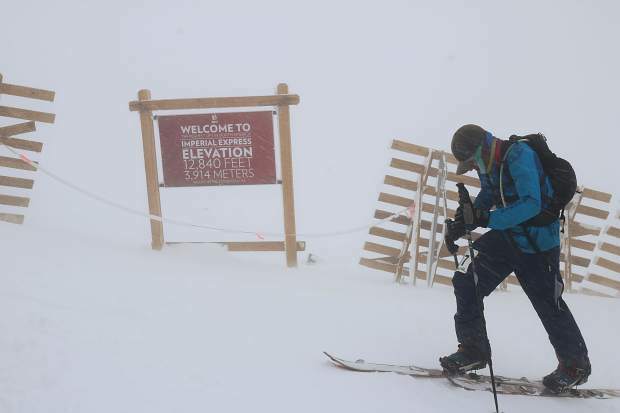 A competitor braces against the wind and blowing snow as he skins up the Imperial Challenge 'pseudo triathlon' race course past the Imperial Express lift, the highest lift in North America at 12,840 feet. Patrick Crane skins up Breckenridge Ski Resort during Saturday's 27th annual Imperial Challenge 'pseduo triathlon' race. The annual race requires participants to either run or bike nearly seven miles to the base of Breckenridge Ski Resort before skinning uphill to the Imperial Express lift before descending via snowboard or downhill ski. Crane finished the race in two hours, 24 minutes and 32 seconds. 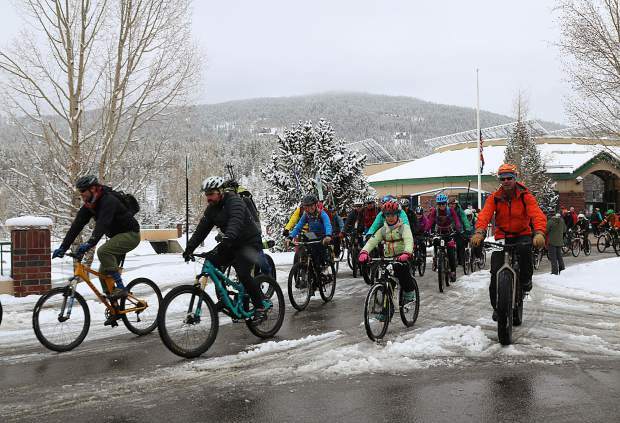 Participants set out on the bike portion of the 27th annual Imperial Challenge "pseudo triathlon" race, including 10-year-old Breckenridge resident Victoria Campbell (pink mittens) who completed the race with her father Craig, making her the youngest conqueror of the 2018 Imperial Challenge. The annual race requires participants to either run or bike nearly seven miles to the base of Breckenridge Ski Resort before skinning uphill to the Imperial Express lift before descending via snowboard or downhill ski. 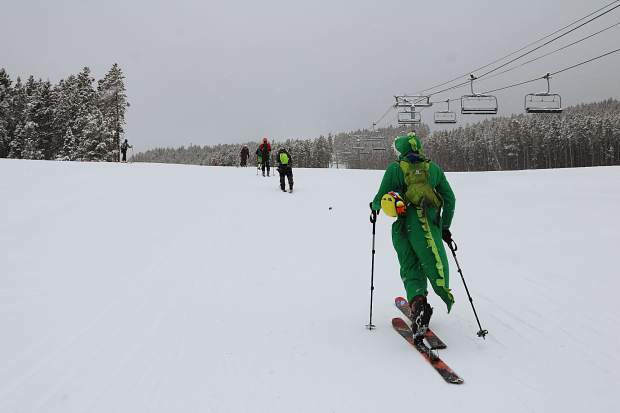 A participant dressed in a dinosaur costume skins up Breckenridge Ski Resort during Saturday's 27th annual Imperial Challenge 'pseduo triathlon' race. The annual race requires participants to either run or bike nearly seven miles to the base of Breckenridge Ski Resort before skinning uphill to the Imperial Express lift before descending via snowboard or downhill ski. Participants transition from the bike/run portion of the Imperial Challenge race to the uphill skin segment at Breckenridge Ski Resort during Saturday's 27th annual Imperial Challenge 'pseduo triathlon' race. 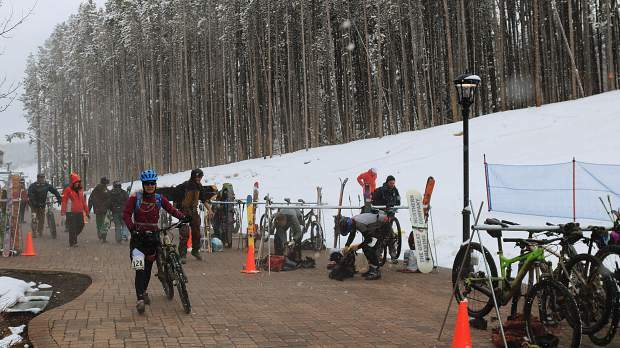 The annual race requires participants to either run or bike nearly seven miles to the base of Breckenridge Ski Resort before skinning uphill to the Imperial Express lift before descending via snowboard or downhill ski. 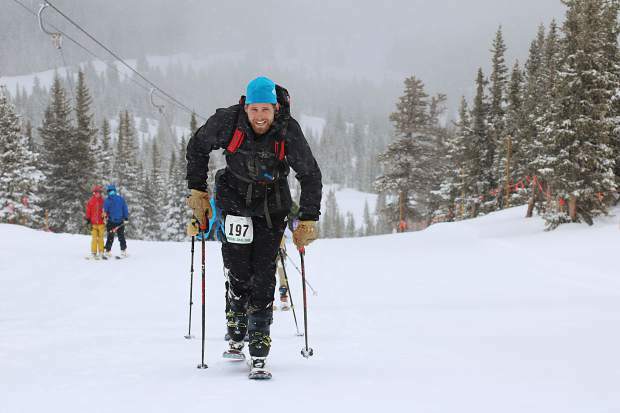 Despite the windy, wet whiteout conditions they all experienced near the top of Breckenridge Ski Resort’s Imperial Express, dozens of Imperial Challenge competitors convened at the base of Peak 8 for awards Saturday afternoon. Medals were handed out to age division and overall champions spanning categories that included running, retro snowshoe and splitboard. But it was 10-year-old Breckenridge resident Victoria Campbell and her family who received the loudest ovation of the day. “We don’t have any 19-and-under females in the age division,” Imperial Challenge race director Jeff Westcott said through a megaphone. The applause for Campbell continued for 22 seconds before Westcott chimed back in. Victoria, Jackson, father Craig and mother Emily all completed the 27th annual “pseudo-triathlon” race; one that combines either a 6.2-mile dirt road run or bike with ascending 3,000 feet of vertical gain to the top of the resort’s Imperial Express Lift before downhill skiing to the finish line near the resort’s base. This year, though, with 5 inches of heavy, wet snow blanketing Breckenridge as of Saturday morning that 6.2-mile dirt road route turned into a 6.2-mile slog through mud. And with total whiteout conditions at the top of the Imperial Ridge at 12,998 feet, race organizers decided to shorten the ascent by about 100 vertical feet. The conditions didn’t stop the Campbells though. The way it worked out, Jackson was the jackrabbit out ahead, completing the course in 3:14:50. Mom, Emily, last saw Jackson at the transition from the bike to the skin uphill and finished in second. “We high-fived each other, and then he was gone,” Emily Campbell said. As for Dad, Craig, and Victoria, the father-daughter duo stuck together through what she described as a tough slog through the mud on her everyday bike. And that was all before the family ascended uphill. Whatever the challenges, though, her father was there to execute what he regarded as his No. 1 job on Saturday: Ensuring Victoria had the proper nutrition she needed to conquer the Imperial as this year’s youngest contestant. The Campbells returned to Breckenridge for the race to take it on as a family despite the fact that they were taking a sabbatical for their spring break vacation in Fruita. When Victoria crossed the finish line with her dad, she reminded him of the request she made during the skin up. As for Jackson, he was especially proud of himself for completing the race even though he had a flat tire for the final half-mile of the cycle portion. “And I didn’t have a way to fix it,” Jackson said. Around Breckenridge it’s relatively well known that avid ski mountaineer Joe Howdyshell has a tradition each year when he takes on the Imperial: to complete the race in cotton “jorts,” or jean shorts. But on Saturday morning moisture filled the air in Breckenridge as blowing snow obscured visibility. So Howdyshell had to make a decision: To jorts or not to jorts? One hour and 27 minutes after he started his Imperial journey, Howdyshell crossed the finish line first in those jorts, even if they were “frozen open,” due to the moisture, wind and, well, their cotton composition. Howdyshell described this year’s race conditions as worse than any of his previous Imperial attempts, primarily the muddiness and moisture of the bike portion and the total whiteout conditions near the top of Imperial. The mud and moisture froze his derailers — the bike part that controls his ability to change gears — shut. And the whiteout conditions made everything near the top of Imperial — the snow, the sky and the clouds — look exactly the same. But Howdyshell feels the conditions may have given him an advantage over his competition. “At the top of the ski, as you transitioned and started to ski down, it was just complete whiteout vertigo,” Howdyshell said. Cold might be the understatement of the Summit County ski season. Howdyshell’s token jorts were so short his pockets were visible through the bottom, frozen and hanging over his lactic acid-filled quads. Luckily, Howdyshell had his customary wind-proof “windbriefs” underwear on underneath. And when he crossed the finish line, though he was 10 minutes slower than his previous best Imperial time, the perennial bridesmaid second-place finisher Howdyshell had gotten his win despite the toughest conditions in years — maybe ever. “My quads are just hammered right now,” Howdyshell said. “Because some years the skiing is fairly straightforward. But this year, every part of it was bumpy and powdery and wet pow. So it’s all bumps, you just thrash yourself on the bike and your quads are hammered. And you skin 3,000 feet and your quads are even more hammered.